Many experts predict that blockchain technology will be the most disruptive technology since the creation of the internet. Given the amount of industries that face disruption by the distributed ledger technology, it is starting to look like this prediction will come to fruition. While the financial industry is already testing and implementing blockchain technology to improve operational inefficiencies and reduce the costs of financial transactions, there are many more sectors that face disruption as well. According to report by RethinkX by “2030 and with regulatory approval of fully autonomous vehicles, 95% of all U.S. passenger miles will be served by Transport-as-a-Service (TaaS) providers who will own and operate fleets of autonomous electric vehicles providing passengers with higher levels of service, faster rides and vastly increased safety at a cost up to 10 times cheaper than today’s individually owned vehicles. These fleets will include a wide variety of vehicle types, sizes and configurations that meet every kind of consumer need, from driving children to hauling equipment. The TaaS disruption will be driven by economics with the average American family saving more than $5,600 per year in transportation costs, equivalent to a wage raise of 10 percent." Mainstream interest in actually owning a car has been on the wane for some time – The UK Driving and Vehicle Standards Agency (DVSA) figures show that new license applications have declined by 28% over the last ten years, while the University of Michigan has found a pattern of decreasing US drivers which began as far back as 1983. The context for these changes certainly include new economic and social circumstances, but in recent years it is the influence of mobile technology that has fundamentally negated many of the fundamental reasons for car ownership. Ride-sharing and transit services have reduced the practical need for cars in an urban context. Flexibility and immediacy are more valuable – from streamed content to flexible working patterns, the immediacy of online shopping, constant connectivity and customisation has redefined our values. In this light, the prospect of owning a car – complete with responsibilities of insurance, maintenance, commitment to financing a depreciating asset and, of course, driving it – seems more a burden than a benefit. Urban public transportation will become increasingly complex and crowded in the future, as the importance of mobility services like Uber and Lyft grows (with an estimated $69 billion, and $7.5 billion net worth respectively), and more companies look to leverage self-driving cars to launch autonomous ride-hailing services in cities. Carmakers will soon see their core business model swing from private car ownership to subscription access to a suite of transportation options. Technologies like Tesla’s Self-Driving Auto-Pilot capability and Uber’s tiered ride sharing platform are accelerating this transition from private transportation to personalised transport. Today’s ride-sharing technology do not rely on IoT connected cars. Instead, they rely on smartphones that connect drivers with riders. Uber and Lyft, which stand out as the most popular ride-sharing companies, serve millions of people every day. One estimate shows that Uber gives rides to about 40 million people each month worldwide. Lyft provides about 14 million rides per month. 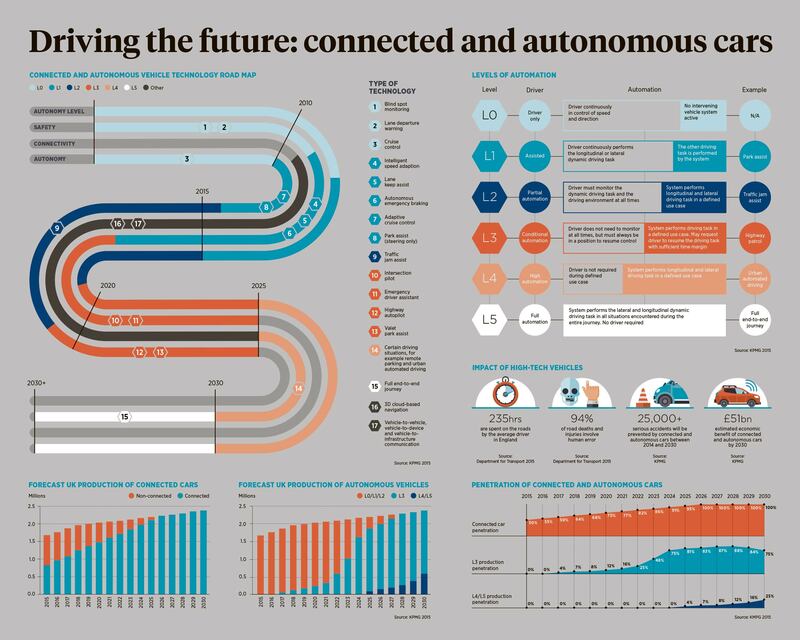 As more cars become connected to the internet, you can expect to see more drivers rely on car dashboards rather than their smartphones. Recent infotainment systems developed by Ford, Honda and several other manufacturers integrate smartphone apps into the car dashboard through Apple CarPlay and Android Auto. In May 2017, Toyota Research Institute announced that it teamed up with MIT Media lab, Oaken Innovations and Commuterz to explore how blockchain could be used to speed up the development of autonomous cars. The project focused on creating a digital environment where users are able to share data safely on every drive that the autonomous car goes. In addition to data sharing, users can also manage ride-sharing and carshare transactions more easily and without a third-party intermediary. The rationale behind using blockchain in autonomous vehicle development is the need for large amounts of driving data from different users as also mentioned by Chris Ballinger, director of mobility services and CFO at TRI: “Hundreds of billions of human driving data may be needed to develop safe and reliable autonomous vehicles.” He also stated that blockchain allows the pooling of data from vehicle owners, fleet managers and manufacturers to decrease the time to reach safe autonomous vehicles and to increase safety, efficiency and convenience. Additionally, Toyota Motor Company also believes that blockchain will allow the company to lower costs and increase efficiency. And with the decentralised nature of blockchain, this would also enable drivers and passengers to make P2P bids without centralised mechanisms that sets prices or takes a fee such as Uber. Indeed blockchain may disrupt the disruptors as consumers and service providers can meet without the need for a centralised bureaucracy. An added benefit of using a blockchain powered ride sharing system would be to enable drivers to keep the 20-25% fees that are typically charged by platforms. Blockchain is a distributed ledger system that maintains a continuously growing record of transactions, or blocks, where each block is linked to a previous block and cannot be altered or reversed once it is added to the chain, and which does not require a central administrator to guarantee the veracity of any transaction. It is essentially a technological solution to the issue of trust in a record or transaction. Blockchain is the underlying technology behind bitcoin, which is a digital token that allows one party to pay another anywhere in the world for goods and services, in some ways like cash. Just like a dollar bill, a bitcoin, once used, permanently passes to another person and cannot be reused or unilaterally withdrawn. With a dollar bill, this is because the bill physically passes to another party; with a bitcoin, this is because the transaction is etched in the public ledger and cannot be undone. Blockchain technology eliminates situations akin to receiving a blank check where there is no value in the underlying account or paying a seller for land that he does not own. Furthermore, because the transaction itself is secure, the cost of the transaction can be significantly lower when compared to traditional payment methods such as credit card payments, international remittances, or any situation where there is a third party guarantor. Ethereum and the rise of smart contracts: The Ethereum public blockchain emerged in 2014 as an open source project and alternative to the Bitcoin blockchain — specifically designed to be ‘the world’s super computer’. Through the introduction of ‘smart contract’ capability, applications built on Ethereum can automate a range of business dealings between parties. In theory, without the need for human intervention from a legal perspective. A smart contract is a computer protocol intended to digitally facilitate, verify, or enforce the negotiation or performance of a contract. Smart contracts allow the performance of credible transactions without third parties. These transactions are trackable and irreversible. Smart contracts were first proposed by Nick Szabo, who coined the term, in 1994. Proponents of smart contracts claim that many kinds of contractual clauses may be made partially or fully self-executing, self-enforcing, or both. The aim of smart contracts is to provide security that is superior to traditional contract law and to reduce other transaction costs associated with contracting. Various cryptocurrencies have implemented types of smart contracts. These properties of blockchain, namely being decentralized, cryptographically secure, immutable and traceable may be a solution to some of the challenges associated with autonomous cars. Decentralized: Blockchain technology is based on a decentralized architecture, which allows a massive number of nodes (computers) to participate in reaching a consensus on the state of the database. The decentralized architecture eliminates the threat of a single point of failure. This is because even if the majority of nodes are not operative there will always be a few nodes which are able to keep the database running. Immutable: Once a transaction and data has been verified through consensus and added to the distributed database it is impossible for a hacker to amend or substitute the blocks in a blockchain. Encrypted: Although blockchains are transparent in that stored data is readily accessible to the public to monitor the combination of data storage and simple encryption allows for data to be only accessible by the owner of such data or by parties which are provided access by the owner. Secure: A major security problem of conventional technologies is the threat of hackers installing a modified, malicious software update which easily compromises the affected systems. Blockchain through usage of public key and private key functionality of cryptography, can require every software update to be signed by the exclusive private key which only the driver and software developer have access to. No Trust Needed: A by-product of the consensus algorithm of blockchain, transparency and its immutability properties means there is no need for a central trusted authority in the system. Counterparties connected by way of a blockchain network can interact with one another in a trustless manner. Reduced latency: Blockchains have many local nodes involved in their architecture which can allow for faster data collection and data transfer. The internet is one of the most transformative new developments of the last century and is often called the ‘information revolution’. Connected vehicles are a relatively new technology. This technology allows a vehicle to communicate with other vehicles, roadside infrastructure and other devices such as mobile phones. This technology can improve safety through giving drivers warning of dangerous conditions ahead or potential collisions. 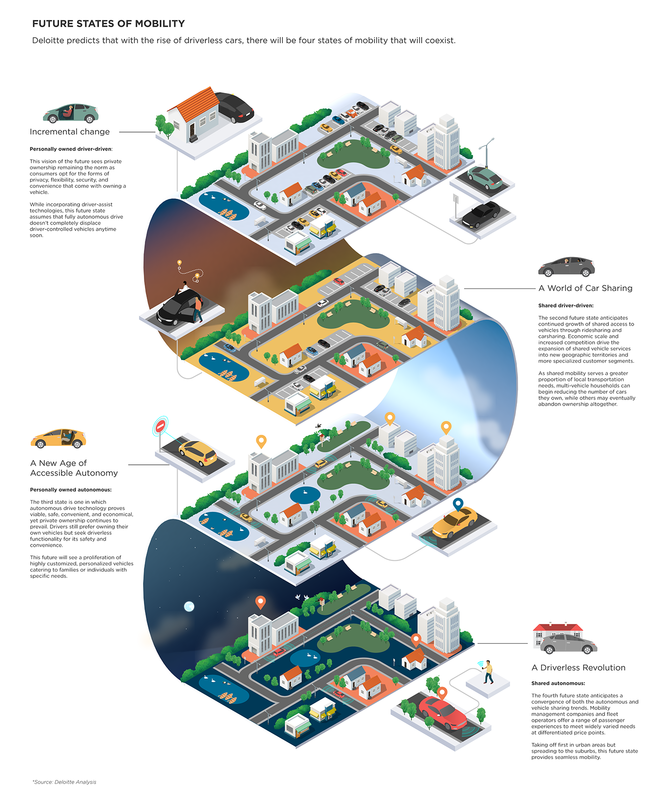 With microprocessor and sensor technology becoming smaller and cheaper, chips and sensors are increasingly being wired into everyday items, new cars have +/- 60–100 sensors on board, and the number of sensors is projected to reach as many as 200 sensors per car. As we begin to embed sensors into more and more devices and objects, and the creation of a ‘cloud’ of data that enables analytics and services to be based on real-time knowledge, or ‘big data’. There are ways this data can be analysed to create knowledge to inform transport decisions such as traffic and incident management, and asset condition monitoring. There will be new and innovative ways ‘big data’ will be used, such as the creation of a digital highway and that could have major impacts on providers and users of the transport system. Could the data from connected and automated vehicles work together as a virtual network manager to improve overall efficiency and direct scarce resources to address the most urgent needs? While still under development, Artificial Intelligence Systems (AIS) are likely to enable a further transformation of transport and urban network management. For many people the family car is the biggest investment after the family home. In addition it is a major expense that is only used for a few hours in the day – and to add insult to injury in large cities most of the time spent is in gridlock rather than actually getting anywhere – for example in London drivers spend more than 100 hours a year in gridlock. In addition a major headache is finding a park once you get to your destination. Various report estimate that cars are in motion only 4% of the time and remain idle most of the time. Despite this low utilization rate car ownership remain high. In 2015, there were 82 registered person vehicles for every 100 people in the US. The sheer volume of stationery cars has serious implications for urban planning as large areas of urban space are occupied by carparks. The concept of car sharing is not new to transport. We share rides on public transport services such as trains, taxis, trams, buses and ferries. Car sharing or shared mobility is also in use in the private sector – for example, commercial freight transport, aeroplanes and long-distance buses. But with new technology, the concept of shared mobility is expanding to private vehicles as a commercial market . Car sharing allows people to rent a vehicle for a short period, often only a few hours. This is a business model variation on traditional car rental where the car is hired for one day or longer. The vehicle is picked up from a designated location and returned to the same or a different designated location. Companies that offer these services include ZipCar, StreetCar and Hertz 24/7. This model is useful for people not wanting to own a car or those with only occasional need for a car. Car sharing offers the opportunity to reduce the number of cars in use, particularly in urban areas, and is primarily focused on higher density urban areas where people can walk to and from the vehicle when they need it. In addition, there are peer-to-peer apps that allow car sharing of vehicles owned by private individuals. Companies that have created peer-to-peer services include Turo and Get Around. Ride sharing is different from car sharing. Ride sharing makes use of shared rides prebooked via a smartphone. For example, Uber commenced operations in San Francisco in 2009. It allows users to book and pay for a ride using a phone application. The transaction is electronic, the trip is electronically mapped and monitored, and both driver and passenger can rate one another on service and other features of the trip. Other ride-sharing companies include Lyft, Via, Arcade City, La’Zooz and Haxi. uberPOOL and similar services allow people to split the cost of a ride. In London, UberPool was used more than 1 million times, while in San Francisco, 40% of Uber trips are pooled. In the first three months of 2016, ride sharing with uberPOOL eliminated 34 million kilometres of car trips. In Los Angeles, people took over 4.3 million miles. This new emerging business model is called ‘Mobility as a Service’ (MaaS). The mobility as a service concept aims to reorganise the personal transport sector and to create a door-to-door mobility service. In this model, consumers can pre-purchase mobility packages to suit their needs, similar to the range of mobile phone packages that are available to consumers. Innovation in freight transport services is taking a similar pathway to innovation in shared mobility for passenger transport. Currently there is inefficiency in freight transport, evidenced by the amount of empty backloads and time spent on paperwork. New technology can make existing freight transport much more efficient. By implementing Blockchain technology in the collaborative economy, it is no longer necessary for a central authority to ensure that the terms and conditions are met and that transactions are carried out accordingly with customers. The distributed ledger technology can provide smart contracts, digital identities linked to a publicly viewable user reputation systems and digital currency payments, all of which alleviate the need for a central authority. Automation arguably is the most significant factor likely to affect transport over the coming decades. Autonomous vehicles will catapult car sharing from hipster eccentricity to mainstream practice. The convergence of the sharing economy coupled with distributed ledger technologies will enable cars to remain constantly active – offering transport to paying passengers. Automated trains are common in commuter metro systems around the world. Automated trains have been used for around 50 years. Distributed ledger technologies will facilitate mainstream adoption of car sharing by scheduling and matching rides without the need for a middleman. Distributed ledger technologies can allow information on vehicle availability to be made publicly accessible so that users and car owners can match journeys easily. Scheduling is particularly important for car sharing platforms offering one-way trips such as ZipCar and DriveNow by BMW as they often involve return trips to urban areas. Motor vehicle manufacturers are progressively introducing increasing levels of automated driving controls in their vehicles. Automated road vehicles have some level of system automation that do not require a human driver for at least part of the driving task and use a range of technologies. 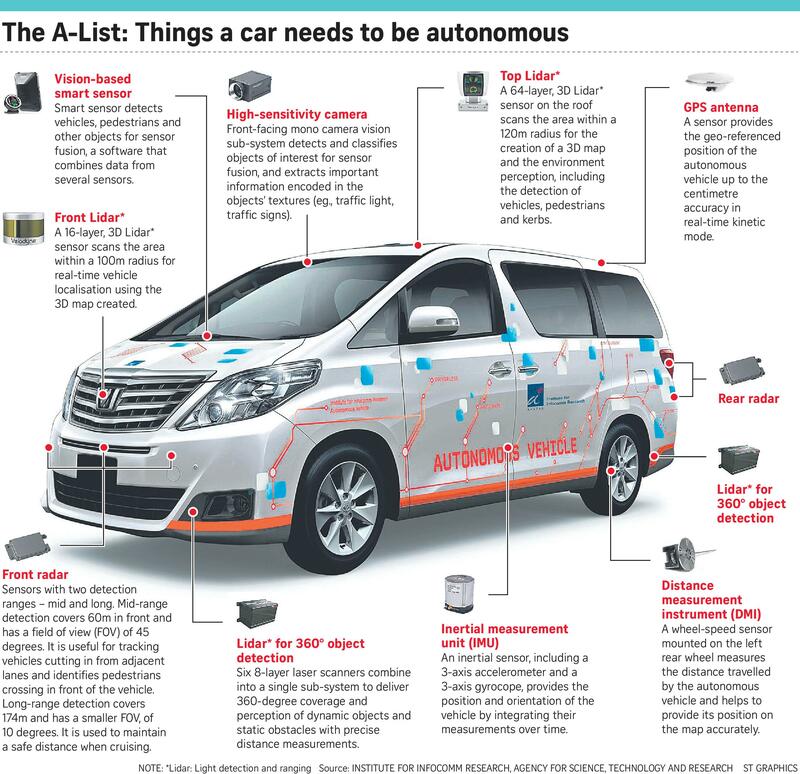 Autonomous vehicles rely on a series of sensors, including GPS to navigate, LiDAR to avoid collisions as well as an array of laser and optical technology, in addition to satellite position receivers combined with accurate mapping, communications and C-ITS technology. C-ITS refers to a subset of intelligent transport systems in which the different elements of the transport network – vehicles, roads, infrastructure – share information with each other by broadcasting signals. Shared information on conditions, incidents and traffic enables the coordination of vehicle movements and the avoidance of collisions. In order to be driverless the vehicles have to be basically enveloped in data and will also need to feedback data in order to strengthen the network of autonomous vehicles. Blockchain powered data pooling would improve safety, efficiency and convenience. Examples would include flagging intersections or blind corners where there is a high incidence of hard braking. This flagging would serve as a warning to autonomous vehicles to take extra caution in such area. Blockchain technology can additionally be utilised to transact real-time data packets and incentivise car owners to share data and thereby strengthen the overall vehicle network. Map platforms like Google Maps will likely purchase traffic information on expected delays around a new construction site and local council authorities may purchase information on the location of potholes that have been detected. Blockchain coupled with cryptographic encryption enables relevant portions of data to be only accessible by authenticated parties, such as pothole locations for council authorities. The blockchain would guarantee the vehicle as a legitimate source of data while keeping details such as registration number, passenger identity or vehicle speed secret. Already today there are a number of companies using blockchain to enable data sharing. For example Toyota Research Institute (TRI) uses blockchain to connect the varied onboard sensors used by vehicles while allowing consumers to own “their” data. TRI has partnered with BigchainDB to build a data exchange to allow for driver data sharing. Streamr is creating a decentralised data marketplace that allows users and machines to handle data in a completely P2P environment. Another way distributed ledger technology could support autonomous driving is to enable vehicle-related payments without human interaction. No-one enjoys refueling, recharging, maintenance, parking – so why not let the vehicle do these things on its own – and also pay for the services at the same time. Beyond facilitating daily operational micro-transactions, distributed ledger technologies may also offer a solution to the difficulties in storing solar-generated electricity. Rather than being distributed via a centralized grid the blockchain technology would allow excess electricity generated by nearby solar panels to be sold on a P2P basis to passing by automated vehicles. This would greatly reduce the cost associated with electricity being lost in transmission around a grid. UBS (United Bank of Switzerland) has teamed up with ZF Friedrichshafen AG, an automotive technology company, and innogy Innovation Hub, to provide blockchain-backed eWallet for electric cars. In this payment system, the end users transfer money from their computers or mobile wallet into vehicle eWallet. The eWallet then enables end users to pay on-the-go for parking fees, electric charging, highway tolls and receive fees for car sharing. Overall, blockchain based eWallet can facilitate payment efficiency especially when blockchain enables peer-to-peer transactions and eliminates intermediaries. Currently, the car insurance claims process is disjointed, but the process can be improved significantly through smart contracts. The smart contract records the policy, driving record and reports of all drivers, enabling Internet of Things-equipped vehicles to execute initial claims shortly after an accident. Car insurance is not generally thought of as being innovative. However, autonomous vehicles coupled with blockchain based advanced data sharing functionality and payments will allow for new forms of car insurance models not previously possible. Currently car insurance models are based on yearly premiums even though this has no relationship as to how much the car is in operation or indeed at risk. Blockchain will make it possible to move to a usage-based insurance (UBI) or ‘pay as you drive’ (PAYD) system. Before fully autonomous driving becomes a reality data collected from advanced sensors can be compiled and put into a blockchain which would reveal driving behaviour and habits of individuals. This would in turn allow insurers to give discounts or better premiums for good driving. While blockchain is not the only solution for storing this information, the immutable and auditable nature of a blockchain ledger provides increased transparency and significantly reduces possibility of fraud. This in turn will allow insurers to lower premiums. When autonomous vehicles achieve full autonomy then insurance may be calculated on a pro-rata basis along with a mileage fee per ride. Blockchain and smart contracts could be further utilised for insurance claim processing, by automating claims submission and payouts and automatically deploying service technicians. Gem and Toyota are currently working on usage-based insurance products tied to the telematics that are being produced by a user’s vehicle. These companies provide a ledger for distributed inputs from a number of different sources which can then be used to automate much of the insurance claim process. Distributed ledger technology is also being applied to create immutable, verified ledgers of a vehicle’s history. Although this is a useful application for traditional cars, it is particularly useful as we move towards autonomous vehicles. Shared car use will rise relative to personal car ownership as a natural result of autonomous vehicles. As more people move to car sharing there will be increasing numbers of consumers interested to know details about the vehicle’s history i.e. kilometres driven, any accidents etc. As previously mentioned, Innogy announced plans for a blockchain platform that creates a digital ‘twin’ of the car which will record details provided by the manufacturer, repair shops and the car itself and which will be stored on the IOTA tangle. Through blockchain data verification, passengers and owners will be confident that odometer readings have not been tampered with and that any accidents or defects have been dutifully recorded. Don’t forget to see the next feature where I will cover Ride Sharing Decentralised Transportation Companies, which will be published on Monday the 12th of March. Policymakers will face several critical junctures when their decisions will either help accelerate or delay the transition to Transport-as-a-Service (TaaS). The first and most critical decision is whether to remove barriers at the national level, or by city or state. A national approach would be far faster. The U.S. government pledged $4 billion to accelerate the development of self-driving cars on a national basis. The National Highway Traffic Safety Administration (NHTSA) has already started developing a “framework for the safe and rapid deployment of these advanced technologies. But California is not waiting for the federal government and has approved requests by 30 companies to test their self-driving cars on public roads and has proposed rules to allow fully autonomous (Level 5) vehicles as soon as this year. Can An Arcane Crypto Ledger Replace Uber, Spotify And Airbnb? Uber’s Future Beyond 2018–Will it Survive?